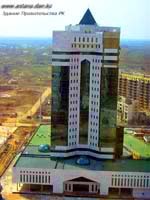 The legislative branch in Kazakhstan is represented by a bicameral Parliament: a Lower Chamber - the Majilis, and an Upper Chamber - the Senate. According to the Constitution, the Parliament is a high representative body of the Republic which carries out legislative functions. The Senate is established by elections in each region, city and the capital of Kazakhstan deputies at joint session of deputies of all representative bodies of regions, cities of republican importance and the capital. Seven deputies of Senate are appointed by the president. There 39 deputies in the Upper Chamber, 32 of them are elected, 7 are appointed by the Head of state. Exclusive powers of the Upper Chamber of Parliament of Kazakhstan. By the presentation of the President, election and relieve from the post the head of Supreme court, the heads of Supreme court Board and judges, tendering an oath. Give the consent to the appointment by the President of Procurator - General of Kazakhstan and the Head of the Committee of national security. To deprive of immunity of Procurator - General, the Head and the judges of the Supreme court of Kazakhstan. Pre-term termination of powers of local representative bodies. Consider the impeachment of the President initiated by Majilis and submit the results to the consideration of joint session of Chambers. Majilis deputies are elected on the basis of direct, equal and universal suffrage at secret ballot. Deputy corps of Majilis is formed by deputies elected by proportional and majority systems. There are 107 deputies in the Lower Chamber of Parliament. Elections of ninety eight deputies of Majilis shall be carried out on the basis of the universal, equal and direct right under secret ballot. Nine deputies of Majilis shall be elected by Assembly of the people of Kazakhstan. Exclusive powers of Lower Chamber of Parliament of Kazakhstan. Delegating two deputies to Qualification Board of Justice. The Government of Kazakhstan exercises executive power, heads the system of executive bodies and provides guidance of their activities. The Head of the government is appointed by the President when the candidature of the premier has been approved by the majority of Parliament. Personal composition of the government is appointed by the President by the presentation of candidatures by premier. Structure and composition of the government of Kazakhstan. Prime-minister submits for a consideration to the President the structure of the government. The structure of the government is - the Prime-Minister, Vice Prime-Minister, 3 Prime-Minister deputies and 16 ministers. Principal powers of the Government of Kazakhstan: elaboration and realization of principal tendencies of social economic state policy, defense potential of the country, security and guarantee of public order. Submission for the Parliament's (Majilis) consideration the republican budget and its execution report, ensuring the execution of the republican budget. Bring in a bill into Parliament, execution ensuring. Guidance ministries, state committees, other central and local executive bodies activities. Appointing to a post and dismissal the heads of central executive bodies that are out of government. Termination of the powers of the Government of Kazakhstan. The government resigns its powers before a new elected Head of state. The government declares its go out to the President when Parliament (Majilis) passes the vote of no confidence. Also tenders the resignation on the initiative of the President and when Prime-Minister resigned. Judicial power is realized through civil, administrative and penal procedure. Bodies of judicial power are the Supreme Court and inferior courts. The particularity of Kazakh procedure is the absence of arbitration procedure. Economic disputes are resolved in civil procedure despite of subjects. Courts take the judicial acts in the form of decisions, sentences, determination and orders. Supreme Court is a high judicial body on civil, penal, economic and other cases jurisdictional to inferior courts, controls their activities and provides clarifications of judicial practice. 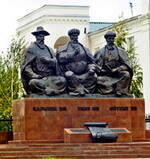 Constitutional council of Kazakhstan has a particular position in the political system of Kazakhstan. Its powers are defined in the article 72 of the Constitution. The conformity of the ratifications of international treaties to the Constitution. The conclusion of the observance of the established constitutional proceedings before Parliament takes a decision about the pre-term discharge from the post of the President, final decision on renouncement from the post of the President. The final decision of the Constitutional council entries into force from the date when the decision has been taken and is obligatory over all territory of the country irrevocable and without further appeal. Other decision entries into force in the order defined by the Constitutional council. When the objections of the President cannot be overcome then the decision of the Constitutional council is not accepted and constitutional procedure terminates.